The professional center at Oleander Oaks is on Oleander Dr., 2.2 miles east of College Rd. on the left, and one mile west of the Bradley Creek / Trooper Clarence L. Swartz Bridge on the right, next to Port City Java (previous location of Dunkin' Donuts) and near Scuba-Now (previous location of Bert’s Surf Shop), one mile from Cape Fear Hospital. Collins Law Firm focuses on a trial practice and concentrates on personal injury, traffic, and criminal defense matters including: automobile and truck or tractor trailer accidents, wrongful death cases, car wreck and property damage matters, most types of criminal matters including traffic citations, speeding tickets, stop sign tickets and red light violations, no operator's license, driving during revocation, DUI / DWI (driving while impaired), all drug and alcohol crimes, felonies, misdemeanors, among others. We also handle some general civil litigation matters. We offer free consultations for personal injury matters which are handled on a contingency basis. That means we only charge a fee if we recover money for you. We offer free telephone consultations for minor traffic matters or less serious criminal charges, and a consultation fee for in person consultations for most criminal matters. Our office is located in Wilmington, North Carolina in New Hanover County, and Mr. Collins is licensed to practice law in both North Carolina and South Carolina. 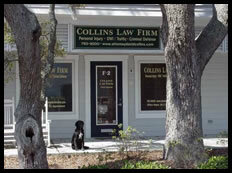 We handle serious personal injury matters all over both states. We handle criminal and traffic matters in southeastern North Carolina including New Hanover / Wilmington, Brunswick / Bolivia, Pender / Burgaw, Onslow / Jacksonville, Duplin / Kenansville, Sampson / Clinton, Bladen / Elizabethtown, Columbus / Whiteville, and most simple speeding violations all over South Carolina for North Carolina licensed drivers (i.e. drivers with North Carolina driver's licenses charged with traffic violations in South Carolina). If you need help in any of these areas, call us anytime - 24 / 7, and if we are unavailable, we will return your call soon. For emergencies only, page us anytime on our emergency pager and we will do our best to call you back immediately.